Our new 2/4 berth Roller Team is very special indeed. The fabulous interior features a luxury fixed bed and mattress with a level of comfort you'd love to have at home. The Roller Team 694 is ideal for couples and small families looking for flexibility and space. Featuring a fixed double bed to the rear and dinette that converts to a double bed and lots of clever storage. 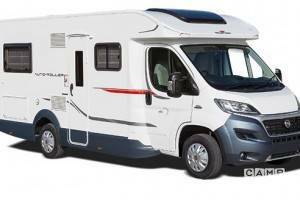 This Motorhome has two double beds, but is best most comfortable used as a 2 berth. With this superb vehicle we are, yet again, raising the standard of luxury motorhome travel to a new height. Please note it is a minimum of a 3 day rental.